Discounts for council tenants wanting to buy their home may be increased to a maximum of £50,000 in England under government proposals. Most "right-to-buy" discounts are capped - from £16,000 in most of London to £38,000 in parts of the South East. Plans to raise them have been put out to consultation as the government seeks to "reinvigorate" the scheme. Housing Minister Grant Shapps said it would mean right-to-buy was no longer an "empty promise" for many tenants. But housing charity Shelter has warned that any new scheme must include "rigorous affordability checks" to ensure people can afford to buy and maintain their home. Plans to raise right-to-buy discounts for tenants in England were announced in the government's housing strategy for England last month and in the chancellor's Autumn Statement. Ministers say that for every home sold, the government will provide a new "affordable" home, the majority of which are expected to be new builds. Under current rules, council tenants and housing association tenants who were in their home when it was transferred from council landlords have the right to buy their properties at a discount, after five years as a tenant. The discount can be as much as up to 70 per cent of flats and 60 per cent of houses - depending on the length of time the buyer has been a tenant - but in practice the government says most discounts are limited by caps. Mr Shapps said the previous "miserly" restrictions on right-to-buy meant the scheme had become an "empty promise" for many tenants. There were fewer than 3,700 sales last year, compared with 84,000 less than 10 years ago, he added. The new proposals would "dramatically increase the discounts under right-to-buy, ensuring it once again becomes a meaningful tool to support tenants who want to buy the home they live in", said Mr Shapps. 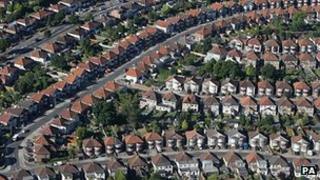 The plans are part of the government's attempt to boost home ownership as well as the housing market. It has also announced a mortgage indemnity scheme, allowing first-time buyers to borrow up to 95% of the property's value. On Thursday, the housing minister also outlined details of a £420m fund aimed at getting stalled building schemes, which have planning permission but have been shut down due to a lack of finance, moving. But Labour says the government has failed to get a grip on the problem. "With millions in need of a decent home at a price they can afford, the country is gripped by a growing housing crisis," said shadow housing minister Jack Dromey. "The government's housing policies are failing and George Osborne's mismanagement of the economy is making things worse, holding back housebuilding." Paul Smee, from the Council of Mortgage Lenders, welcomed the changes in principle and said that under proposals from the Financial Services Authority this week, all tenants seeking a mortgage would have to get advice on lending which would offer "significant protection". "As with all other mortgages, lenders will need to conform to all relevant regulatory requirements, reflect their own risk appetites and take account of both the borrower's circumstances and whether the property represents adequate security," he said. The Department for Communities and Local Government is consulting on the proposals until 2 February.